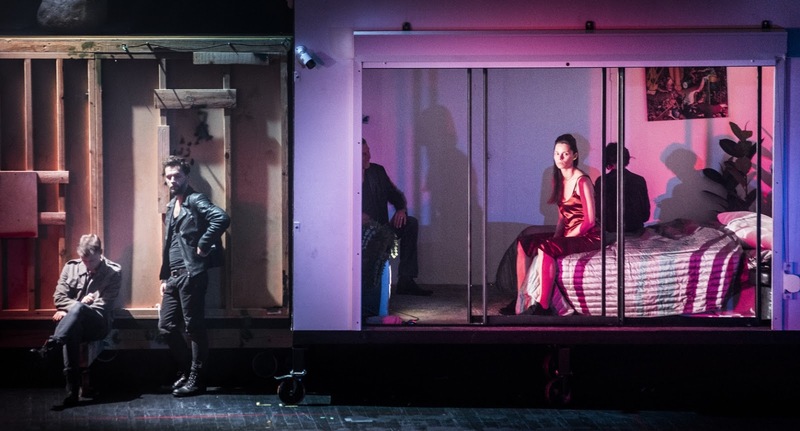 Polish director Łukasz Twarkowski’s production of Lokis – a Very Free adaptation of Prosper “Carmen” Mérimée’s horror story of the same name – is about the most impressive use of video that I’ve ever seen on stage. The whole thing lasts around three hours (plus interval) and for long stretches is almost hypnotic in the way it operates. The plot of the original is apparently some insane French confection (which *was* originally set in Lithuania; hence the interest, presumably) about a woman who is attacked by a bear, and nine months later gives birth to a son, who in turn goes on to kill his bride on their wedding day. Or something. What’s really compelling here, however, is the stagecraft. 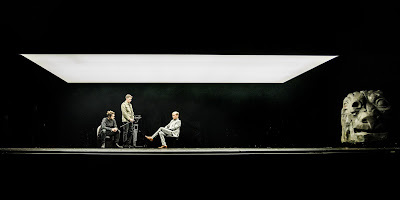 The thing opens (a bit like Dead Centre’s Lippy) with “the director,” and eventually his whole team, talking about their rationales for making the piece. While interesting in its own right, this also sets up the audience perfectly and effortlessly with a way to approach watching it. There then follows one of the best bits of lighting-design-as-performance that I’ve seen. Again, reminiscent of the David Lynch aesthetic, but at the same time completely theatrical. From this, the thing starts to move into a version of the Katie Mitchell camera show, as if reimagined by the Frank Castorf/Gob Squad camera show (as it were). I don’t think it’s an exaggeration to say that it’s the best video work I’ve ever seen on stage. If anything, it’s more like Sebastian Schipper’s film Victoria than anything you’re used to seeing on stage: there’s both the fluidity and anarchy of Castorf but with the eye for a decent shot of Mitchell’s video collaborators, but without the static painterliness. As it happens, a fascinating thing happened the night I saw Lokis: about twenty minutes from then end, the live-feed went completely dead. The entire rest of everything continued, and someone came out into the middle of the stage – as if totally intentional – and told a strange story/joke about a rabbit in a wood(?). Or something. Then the scene that had cut out started again. Given the rest of the show, it was genuinely impossible to say for sure whether it was a real mistake, a slightly odd dramaturgical decision, or actually great. I’d have been happy with any option as the “correct” explanation. Similarly, while it’s not a piece which really draws attention to its actors (the style and anti-narrative really militate against it), you do eventually notice just how great they are – just really subtle, understated, naturalistic-but-not kind of acting that communicates everything you need to know without somehow making communication the point. So, yes: while in places at time-of-watching it felt slightly “over-long,” on reflection, I don’t think I’ve have wanted them to cut anything to “streamline” it. I was never bored, and it was great just to be able to sit back and have the senses assaulted by this maelstrom of smoke and strobes and music and video, executed with rare panache, exploring something curdled at the heart of humanity.